(L to R) Orla O’Connor, Grainne Griffin, Ailbhe Smyth in the RDS during the referendum count. 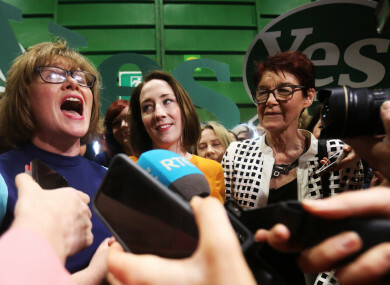 THREE ACTIVISTS WHO led the Together for Yes campaign during the Eighth Amendment referendum have been named on Time magazine’s list of ‘Most Influential’ people for 2019. Grainne Griffin, Ailbhe Smyth and Orla O’Connor were named in the ‘Icons’ section of the list, alongside newsmakers including Taylor Swift, Lady Gaga and Michelle Obama. Donald Trump, Pope Francis and Xi Jinping are among heads of state to make the Top 100 in the ‘Leaders’ category. Taoiseach Leo Varadkar was named on Time’s most influential list last year. Their incredible tenacity and integrity and courageousness will be an inspiration for generations to come. Negga says that the Together for Yes campaign, “put the Mná na hÉireann (women of Ireland) front, centre and in control of their own bodies and rights like never before”. The Together for Yes campaign was an umbrella group a made up of about 70 civil society groups that campaigned successfully for a Yes vote in the 2018 Eighth Amendment referendum. Griffin, Smyth and O’Connor were co-directors of the group having each campaigned for the holding of a referendum as part of different groups. Griffin is a founding member of the Abortion Rights Campaign and O’Connor is director of the National Women’s Council of Ireland. Smyth, who was convenor of the Campaign to Repeal the Eighth Amendment, said Ireland’s result has had an impact beyond these shores. “We are honoured to receive this accolade from Time Magazine. It is evidence of the significant international ‘ripple’ impact of the Together for Yes campaign,” she said today. Email “Together for Yes activists named on Time magazine's top 100 list of most influential people”. Feedback on “Together for Yes activists named on Time magazine's top 100 list of most influential people”.